Here on the upper Eastern Shore we’ve been suffering for weeks now. What little rain we’ve had – literally a few drops here, a minutes-long shower there — has been exceedingly spotty. I got a whole inch one day nearly three weeks ago while Colchester CSA down the road got only one tenth. I had emptied all the rain barrels on the garden before the rain and had to fall back on the chlorinated town water just to keep things alive. The corn is piped (the leaves curl in on themselves to preserve moisture) and the farmers are chewing their nails if they don’t have irrigation. This is a different story from the way the growing season began. This spring was chilly and wet until fairly late. Theresa, the manager/farmer of Colchester and other farmers were stressing out in May over the fact that they couldn’t get into the fields to plant. Then it stopped. It got hot and dry. The change took me at least slightly by surprise since I had put the tomato plants in early in an effort to rush production. 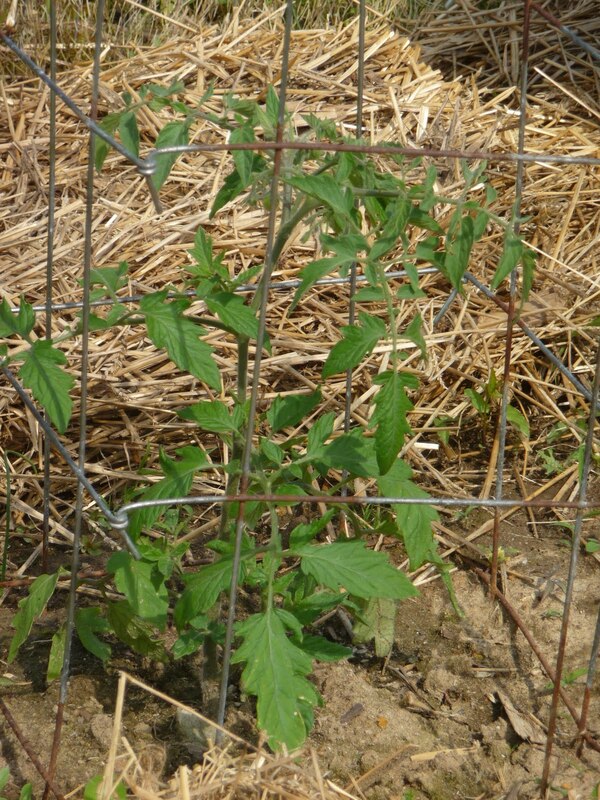 The cherry tomatoes, which are generally tougher than the slicing and canning varieties in my experience, went into a fence-protected northwest corner of the garden, but because of the chill and the wet, I didn’t mulch with straw as usual. I wanted the dark, exposed ground to heat up and dry out some so the roots wouldn’t rot. But I was slow realizing that we had actually turned a corner on the weather, and took a little time mulching and supplementing with rain barrel water. 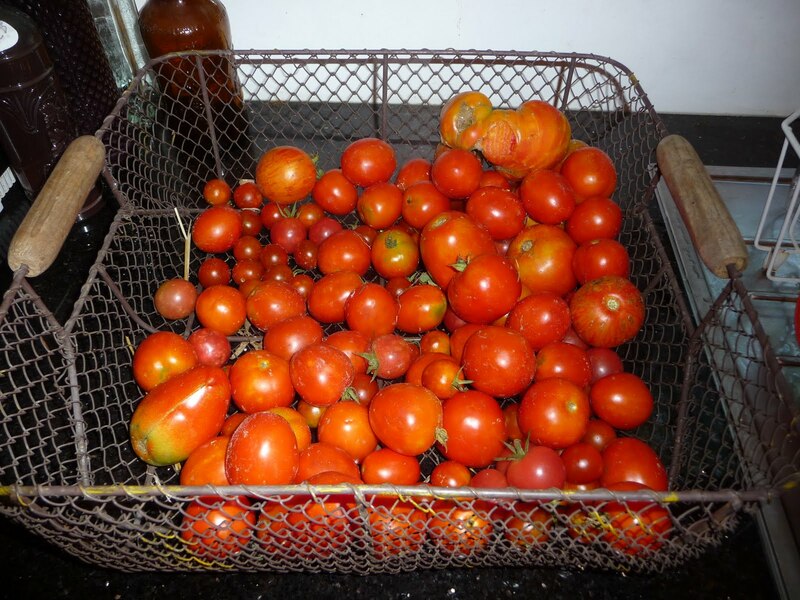 Even so, I was picking cherry tomatoes in early June. About a week later, I had a few of the early-season, cool-weather tolerant hybrid slicers — Siberians and Northern Exposures. Those two hyrbids were a season-pushing experiment for us, but also because I grow plants for friends in the Adirondacks, who have a café and wine bar. (barVino, North Creek, NY; it’s worth visiting). I’ve also been getting a cucumber variety called “Greenhouse”, which produces an early, dapper thing about 6 inches long with very thin skin and small seeds. Since they started coming in together, about 3 weeks ago, I’ve been making Greek salad, which I eat it for breakfast, lunch or dinner.The Siberians, I’ve been roasting in the oven or chopping fresh with basil and brie for pasta. Nothing like your own homegrown! Since the blog is grow it EAT IT, below are a couple of recipes, (as though you guys don’t already do these yourselves). Slice in half, with your thumb, scooch out most of the seeds into the compost bucket – this is a one-shot motion a few seeds won’t hurt. Lay the halves cut-side up on a low-sided baking sheet. Sprinkle with a little Kosher salt, some fresh-ground pepper and put into each a little crushed fresh garlic. Roast them in a slow oven (about 275-300F) for about an hour and a half. Some I in a covered container in the frig. Others I marinate by layering them into a frig container drizzled with a little white wine vinegar and some more olive oil then every few says spoon the marinate over them. Both last a long time in the frig. Both are good chopped into salad, spread onto crackers or thin-sliced toasted baguette spread with a little goat cheese, or stuffed into a pepper along with cooked rice and topped with cheddar and baked. The ones without the vinegar are also really nice added to fresh-made pasta puttanesca. Chunks of cuke, halved cherry tomatoes, black olives, fish peppers (mildly hot) pickled from last year, sliced Spanish onion, feta marinated for about an hour i the frig in lemon dressing. Whisk dressing in the bottom of the bowl into which you chop the vegetables and then toss to coat when everything’s chopped up. Silver Palate Cookbook offers are super-quick recipe for brie and pasta with fresh basil and tomatoes. If you cook the pasta while you make the fresh sauce, it all takes about 10 minutes start to finish. Break into chunks a wedge of soft brie cheese and dump them into a bowl. Add an equal amount or more of fresh raw tomatoes (I use cherry varieties early in the season, beefsteak types when they start to come in), a few crushed and minced fresh garlic cloves, a handful of basil leaves torn or don in chiffonade so you really get a hit of them, fresh-ground pepper and some olive oil. Cook pasta (whole grain angel hair is nice), drain and put it immediately into the bowl with what will become the sauce. Mix and serve with a salad and a bottle of red wine.